The apartments are individually furnished with antique furniture and provide every comfort: heating, air-conditioning, hair dryer and television. A washing machine, iron /ironing board, and cribs/cots for small children are available upon request in the common services room. 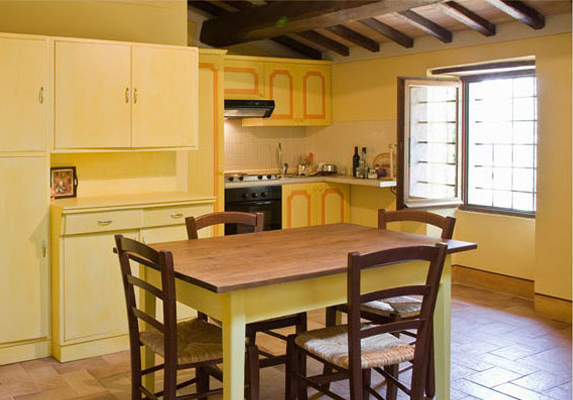 The kitchens are well-equipped with a ventilated oven, refrigerator with freezer, pans, dishes and silverware for four people, coffee and breakfast sets and wine glasses for fully enjoying our excellent wines. The I Mugnai apartment received this name because up until the mid 1900's these were the bedrooms where the millers (“mugnai”) slept during the oil milling season which lasted for months. This apartment is on the upper floor reached by a stairway, opening into a spacious living room that is illuminated by a skylight. It is furnished with a large, comfortable sofa, a television and a big table that matches the antique furniture in the well-equipped kitchen. 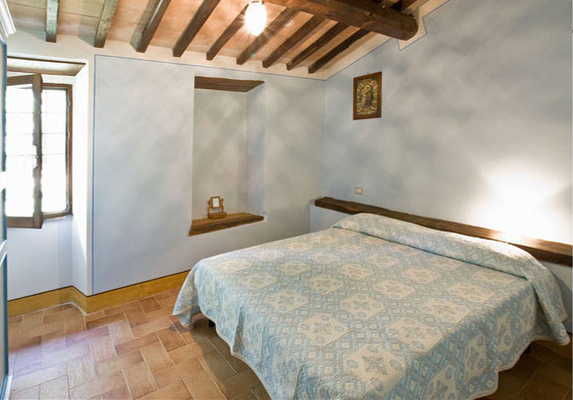 The Master bedroom preserves the original style of the ceiling, with wooden beams and tiling. It has a built-in headboard with an antique plank table that serves as a shelf; a large armoire with drawers and a small armchair complete the room’s furnishings. 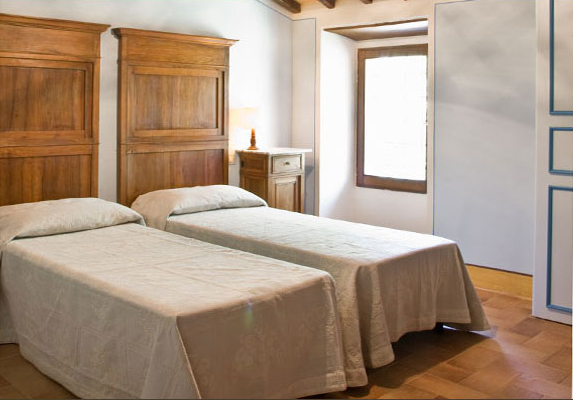 The Double room is furnished with antique headboards, a spacious built-in closet with drawers and a desk. The apartment has one large and comfortable bathroom with a shower. 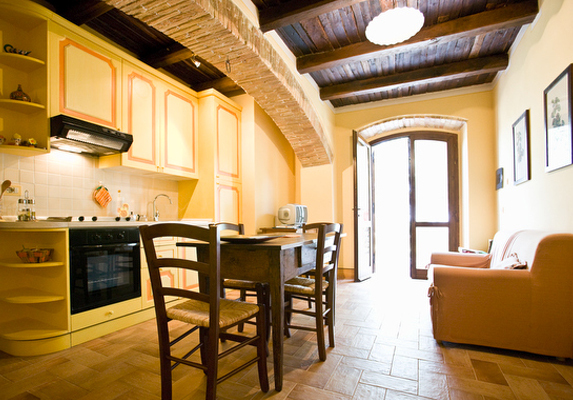 The “Il Tramonto” apartment, located on the ground floor, is especially suited for families with children and for people with disabilities. One enters easily and directly into the living room, where an old sweeping arch divides it from the practical and colorful kitchen. 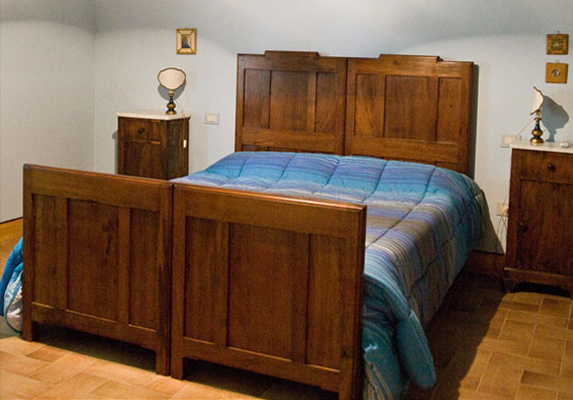 The master bedroom furnished with family heirloom antique furniture. A third bed or a crib for children can be added. A desk and a large armoire with drawers and a full-length mirror complete the room’s furnishings. 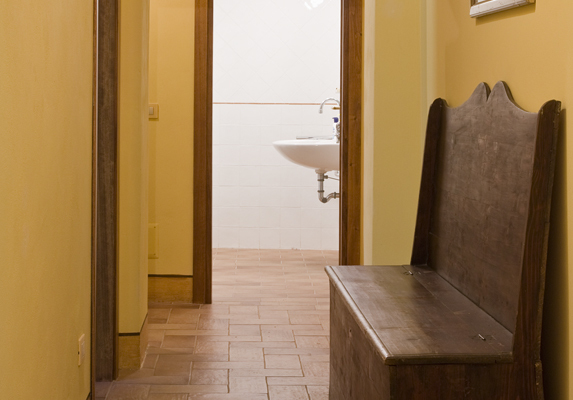 Il Tramonto also has a more intimate double room with a small but unusual window and a spacious and very comfortable bathroom with an ante-bathroom.